In 2006, I was in the early stages of writing Twenty-One Steps of Courage. Prompted by the growing threat of war in Iraq, neighbors in my small town that borders on Marine Corps Base Camp Pendleton began readying for deployment. I was accustomed to the sounds of training; heavy artillery booms that shook my home, small arms fire, helicopters overhead, but this was different. As my novel progressed and I began to surround the protagonist with buddies, a girlfriend, his mother, the military deployment activity in my neighborhood and the protagonist’s similar preparation for war inextricably connected. The San Diego Union-Tribune ran daily stories as the months flew by; some in-depth reports from the battlefield, profiles of eager young recruits getting haircuts, their grins cocky. More ominous features about the lack of personal supplies available to the military personnel streaming to Iraq by the thousands began to monopolize the daily news. Some of my neighbors now lived in bleak conditions in a Forward Operating Base in Iraq, and I grew uneasy as I crafted the life my fictional Soldier faced in an Iraqi sandstorm he didn’t expect. I wanted to help. One day I read a story in the newspaper about military families collecting personal items to ship to Iraq. A photograph depicted a young mom with two kids juggling white Priority Mail boxes covered in tape to protect the bulging sides. Somewhere in the story about how people could help but didn’t have friends or family in the military, I read a sentence about a website, www.anysoldier.com. I logged on that day to learn there were hundreds of letters from military personnel deployed in Iraq, in Afghanistan, and other US military installations throughout the world. They all needed help. I started reading the letters and caught my breath. “I’m not asking for myself,” one sergeant wrote. “My squad needs toothbrushes and toothpaste, disposable razors and deodorant. Baby wipes.” Another letter from a female private asked for hairbands in black and brown. “And tampons,” she wrote. An officer said his Soldiers needed boot socks. The sand gets inside the boots and wears them out fast, he added. There were funny letters too. Young voices tapping out misspelled pleas for “peenuts” and “jurky” but not the “plane” kind, the spicy snacks. The more I read, the more I knew exactly how I could help. Soon I had a stack of Priority Mail boxes in my writing room, a gigantic rol1 of tape, and a folder full of blank customs documents. One day an unusual letter written by two privates caught my eye. “Our squad is taking care of some puppies. We need dog gear, collars, leashes, toys. Maybe treats?” I copied the letter and posted it in a nature preserve where my husband and I walked our dog. By the next day, other dog owners had contributed enough to fill an entire box. Three days later, we had another box! I sent off the packages, with a note inside explaining where the gear came from, never expecting to hear how they were received. About a month later, I got an email message from the two privates expressing their thanks and including photos of “Private Dusty”, a small tan dog and “Private Rusty”, a black dog with an orange blaze on its chest. The thank you note and photos were a bit hit at the nature preserve. Over the next three years, I continued to send boxes of hygiene products, snacks, books, socks while I continued to work on my novel. Occasionally a message from a recipient arrived. Two stay with me. One came from an emergency field hospital. The brief note said the personal hygiene items were appreciated. “Once we cut off uniforms, these guys have nothing. Just a shave makes them feel better.” Another note arrived thanking me and asking if I would reply. Of course, I will, I wrote the Soldier with a curious name, all the while thinking the writer was a man. Two letters later, I learned my pen pal was a woman! We traded letters for two years and after she left the Army, we still keep in touch. Throughout this time, not only were the protagonist’s battle buddies and his family enriched by his fictional experiences my real experiences were too. By the time President Obama announced 33,000 troops would be coming home, my novel was in editing and the push to send white Priority Mail boxes dwindled. 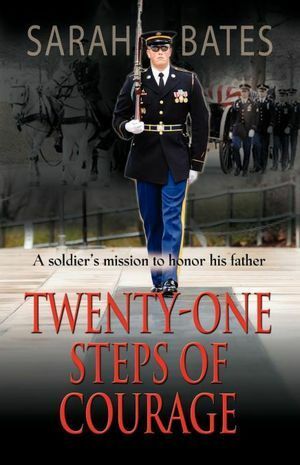 With Twenty-One Steps of Courage published, and American troops still in Iraq and Afghanistan, I’m going to take another look at www.anysoldier.com to see how I can help again. It’s time to read more letters and compose a special shopping list for a stranger putting his or her life on the line for me so I don’t have to do it. Thanks for taking part in the tour and hosting Sarah!